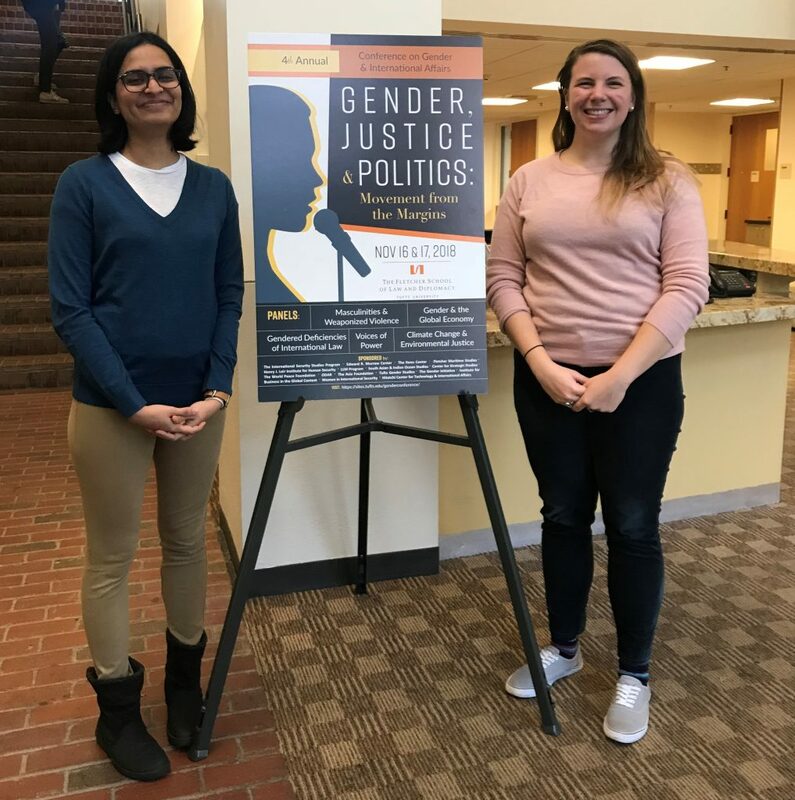 After Dipali Anumol and Kristen Mosher met in Gender Theory & Praxis, a wide-ranging gender studies course at The Fletcher School of Law and Diplomacy, they applied to be the lead coordinators of the fourth annual Conference on Gender and International Affairs. Referencing their prior experience working together, including as volunteers for last year’s conference, the duo believes that their complimentary skill sets create a strong team dynamic and thus a successful conference. The conference, which will be be held on Friday and Saturday, will examine the role that gender plays in fields like law, environmental studies, security studies and economics. Anumol and Mosher are both second–year master’s candidates pursuing concentrations in gender analysis in international studies. They noted that Fletcher provides a unique setting for their studies in such a rapidly evolving and sensitive subject, largely due to its plethora of faculty members who focus on gender studies and incorporate gender into their curricula. Anumol noted the contrast between gender studies at Fletcher and her previous academic environments, including at the Indian Institute of Technology Madras, where she completed her undergraduate studies. “There was this very sort of unfortunate understanding that gender means [just] women,” Anumol said. Mosher explained that, in order to be effective, academia should examine all genders. Mosher added that the conference’s organizers also had difficulty encouraging male students to attend. She noted that while men spend much less time considering the topic, compared to individuals of other gender identities. Anumol noted that contemporary gender studies programs, which are increasingly far-reaching and multifaceted, are the result of recent feminist movements. However, she was quick to point out the many misconceptions of feminism. “Unfortunately, feminism is sort of seen as, ‘Oh, you’re a feminist — you’re like a man-hater or you just want women to do better.’ I think when people understand that feminism is not just women’s rights, but it’s about making sure there’s equality for all genders, then you get a more nuanced understanding of all genders,” Anumol said. Mosher added that this transformation will not develop overnight. “It’s just a mindset shift that is going to take a very long time,” she said. Anumol and Mosher appointed two content chairs, Lauren Michaels and Komal Thakkar, to the conference’s organizing committee. Thakkar explained that, in developing themes for the conference, the team had two goals. According to Mosher, Anumol’s status as an international student has added another dimension to the scope of the conference because she can provide a different context for many of its themes. Anumol also highlighted the importance of selecting a diverse group of panelists who represent many different identities. “[We are] not just trying to get straight privileged white men and women … not just trying to get academics but [also] practitioners and activists and development professionals and lawyers,” she said. Mosher highlighted the conference’s first panel, “Voices of Power,” which she feels best embodies the themes of the conference. “The panel [looks at] who has a voice in the media and academia and how those voices and the identities and thoughts of people who speak and write on the issues affect our understandings of these issues,” Mosher said. “I think it’s a really interesting panel because … when people think about international law, they don’t think that it has gendered implications,” Anumol said. All four Fletcher students share a primary goal for the conference: to bring nuanced studies and discussions of gender to new people and communities. Correction: A previous version of this article contained an incorrect quote from Dipali Anumol. The article has been updated to reflect this change. The Daily regrets this error.